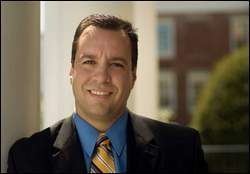 Mayor Mark Hawke began first took office on January 7, 2008. At the age of 35, Mayor Hawke became the City's fourth youngest Mayor behind former Mayors Stephen Erickson (21), Alan Agnelli (23) and Gerald St. Hilaire (31). Mayor Hawke attended Gardner public schools and graduated from Gardner High School in 1990 as a three sport letterman. He then went on to earn his Associates degree from Mount Wachusett Community College in 1993, Bachelors degree in Political Science from the University of Massachusetts at Amherst in 1995, and his Masters in Business Administration (MBA) from Anna Maria College in 2001.